Meticulous director Darren Aronofsky gained a lot of creative cache after Black Swan raked in over $200 million worldwide, a Best Actress Oscar, and heaps of critical acclaim, including from myself (not to imply I was a deciding factor). The man had what all artists dream of, a perfect moment to seize whatever creative project his heart desired. And what he chose was to remake the biblical story of Noah for the masses, with an artistic fury and idiosyncrasy the likes of which audiences have never witnessed. The decision left many scratching their heads, wondering why Aronofsky would waste his time with a story already well told, in an outdated genre (Biblical epic), that would likely turn off evangelical ticket-buyers with any deviations and turn off mainstream audiences with any devotion. It looked like a big budget folly with no way of winning. The box-office is still unwritten, though I suspect the effects will net a pretty penny in overseas grosses, but as far as a creative statement, Noah is far more triumph than folly. Noah (Russell Crowe) is living his life in isolation from the communities of king Tubal-cain (Ray Winstone). Noah and his wife Naameh (Jennifer Connelly), their two older sons Shem (Douglas Booth) and Ham (Logan Lerman), youngest son Japheth (Leo Mchugh Carroll), and adopted daughter Ila (Emma Watson), are living on the outskirts of civilization, aided by a group of fallen angels. Then Noah is given apocalyptic visions of an oncoming flood and the mission to save the world’s animals. 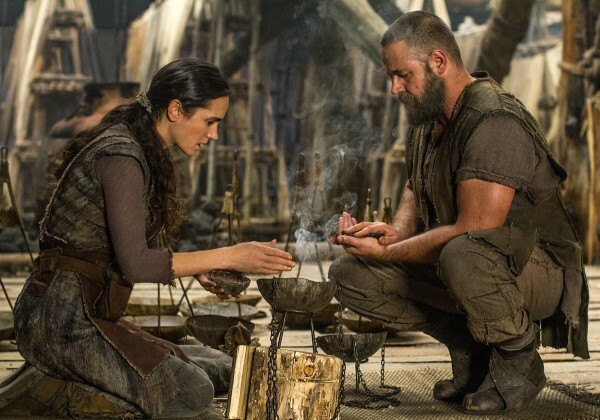 After speaking with his 900-year-old grandfather Methusselah (Anthony Hopkins), Noah is convinced what he must do, and it involves a lot of intensive manual labor. Aronofsky treats Noah and the beginnings like Greek mythology mixed with a Lord of the Rings-style fantasy epic, and it’s madly entertaining. The visuals are stirring, large-scale, and sumptuously memorable (the Earth covered in spiral weather patterns is a standout, along with Noah’s visions and a Tree of Life-style triptych narrating the birth of life). The film has come under fire from conservative critics for its creative deviations from the Bible, but sidestepping a larger conversation, why should a movie be punished because it wants to entertain a wider berth of people than the faithful? Does it truly matter that the people refer to the Big Guy as “The Creator” rather than “God”? Would these people even use the word “God”? This just seems like a petty battle of semantics. It seems like certain critics are looking for any nit to pick. Sure giant rock monsters that were fallen angels might make people snicker, but why should this aspect of the story be any more preposterous than a man and his family gathering two of every biological creature on the planet? I loved the rock creatures, I loved how Aronofsky introduces them, I love how they walk, I love that Aronofsky even finds a way to give them a redemptive storyline, offering an emotional payoff. Seriously, why should these be any harder to swallow for narrative stability? 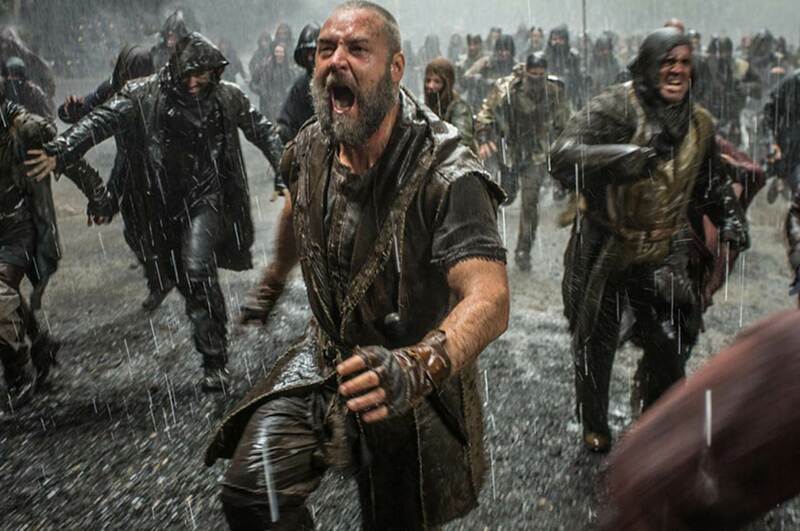 There were fears that Aronofsky would be less than reverent to the source material with his additions and subtractions bringing it to the big screen; Noah is a Biblical epic for our modern age but also one fervently reverent to the lessons of the tale. First off, a literal version of the Genesis tale would be boring and short. There is going to be some additions and they should be welcomed. What Aronofsky and his co-writer Ari Handel (The Fountain) have done is taken a story filled with casual larger-than-life events and given it a smaller human perspective that is thought provoking. When Noah’s sons ask about wives, it’s personal planning but also a necessary part of, you know, repopulating the planet. They’re being anxious teen males but the small, relatable plot line also finds a way to relate to the larger picture, a tactic Aronofsky frequents. There’s a focus on family, fathers and sons, jealousy, but it really comes down to a personal level, differing perspectives about the overall purpose of man. The human-scale provides a richer context for the Biblical tale’s better-known aspects, like Noah turning to the bottle. As a result, we get the special effects spectacle without sacrificing the potent human drama at work. While the movie may never refer to “God” by name, it’s respectful and reverent. Another aspect about what makes Noah so daringly visionary is that it doesn’t blink when it comes to the darkness of the story. Over the years popular culture has neutered the tale of Noah into a cutesy tale about a guy on a boat with a bunch of happy animals. I think we’ve purposely ignored the lager picture, namely how truly horrifying the entire story is. It’s an apocalypse, humanity is wiped out; children and babies are drowning. Everybody dies. 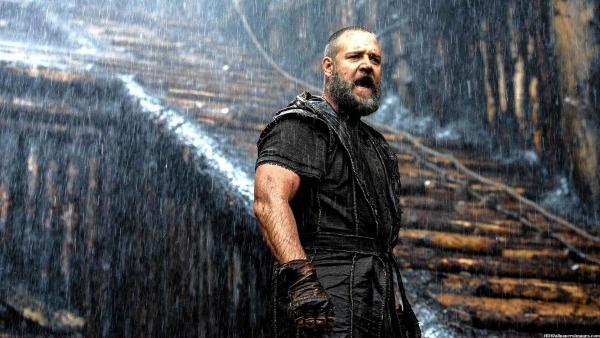 The later brilliance of Noah is that it doesn’t mitigate this horror. Once Noah and his family are inside, the floods having arrived, they painfully listen to the anguished wails of those struggling for life in the waters. The movie forces the characters, and the audience, to deal with the reality of a world-destroying cataclysm. Noah’s visions of the ensuing apocalypse are beautifully disturbing. The film takes place eight or nine generations removed from Adam, and God is already willing to take his ball and go home. After watching mankind’s wickedness, you might sympathize with The Creator. Aronofsky’s film has an unmistakable environmentalist stance (how does one tell this story without being pro-nature? ), but he also shows you the brutality of mankind. The citizens of Tubal-cain have no respect for life, at one point kidnapping crying young girls and literally trading them for meat to eat. Resources are dwindling and people are pushed to the brink. There’s some sudden and bloody violence, as death is not treated in the abstract or with kid gloves. This is no cutesy story for the little ones. No stuffed animal tie-ins. Of course once the flood occurs, the story seems like it’s at an end, Noah and his family having only to patiently wait out before starting over. It’s during this second half where the movie becomes even more personal, challenging, and philosophical. Noah believes that his family was spared to save all of those creatures born on Days 1-5, not so much Day 6 (a.k.a. mankind). He accepts this burden with solemn duty, declaring that his family will be the last of mankind to ever walk the Earth. However, spoilers, his own family pushes him to the test of this declaration. His adopted daughter is pregnant. There is hope that mankind can continue if the child is a girl. Noah sticks to his guns, saying that the child will live if a boy but killed if a girl. Now we’ve got a ticking clock, so to speak, while in the ark, and it manages to be a personal test of Noah’s own faith. How far will he go to enact what he believes to be God’s plan? He’s single-minded in this regard but he’s no zealot, more a flawed and troubled man of virtue trying to make sense of an improbably difficult conundrum. That’s the stuff of great drama, finding a foothold in a debate over the nature of man, whether man is inherently evil and shall lead, once again, to the ruination of God’s paradise. Can Noah place the personal above his burden? This looming conflict tears apart Noah and his family, forcing them into hard choices. Even assuming the film wouldn’t end with Noah butchering his grandchildren, I was riveted. There’s an intellectual heft to go along with all the weird, vibrant spectacle. The film doesn’t exactly break new ground with its fundamental arguments and spiritual questions, but when was the last time you saw a Biblical movie even broach hard topics without zealous certainty? Definitely not Son of God. There’s an ambiguity here to be admired. 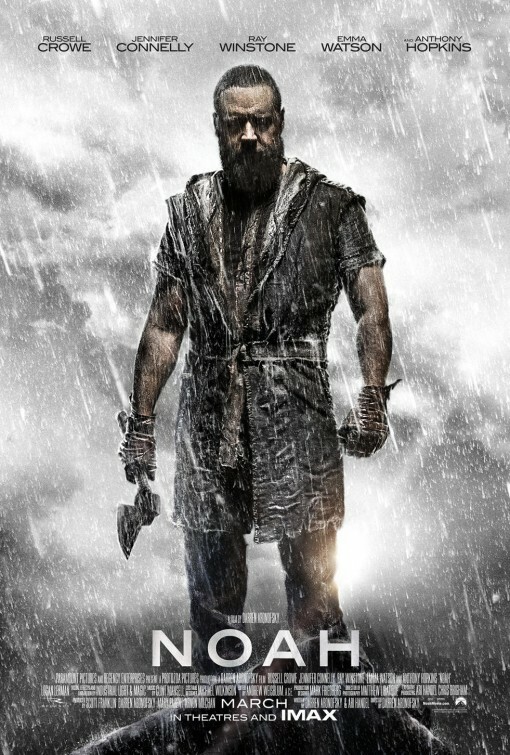 Noah isn’t a spotless hero. The villain, Tubal-cain, actually makes some good points, though we all know they will be fleeting. Tubal-cain is actually given more texture as an antagonist than I anticipated. He’s a man who interprets man’s mission on Earth differently. Whereas Noah views man’s role as being stewards of the Earth, Tubal-cain views man as having been given dominion. They were meant to reap the pleasures of the Earth. Before marching off to take the ark, Tubal-cain pleads for The Creator to speak through him; he longs for a connection that he feels is missing, and so, perhaps a bit spiteful, he declares to act as the Creator would, laying waste to life. That’s far more interesting than just a slovenly king who wants to live to see another day. Aronofsky also benefits from a great cast that sells the drama, large and small. It’s been a long while since Crowe (Les Miserables, Man of Steel) gave a genuinely great performance; goodness it might have been since 2007’s 3:10 to Yuma remake. The man can do quiet strength in his sleep, but with Noah he gets to burrow into his obsession, which just so happens to be sticking to the edict that man does not deserve to spoil the Earth. It’s a decision that challenges him throughout, forcing his will, and Crowe achieves the full multidimensional force of his character. He can be scary, he can be heartbreaking, but he’s always rooted in an understandable perspective. Connelly (Winter’s Tale) overdoes her mannerisms and enunciation at times, like she’s practicing an acting warm-up, but the strength of her performance and its emotions win out. Watson (The Bling Ring) is winsome without overdoing it, Hopkins (R.E.D. 2) provides some comic relief without overdoing it, and Lerman (Percy Jackson) gets to thrive on angst without overdoing it. In short, you’ll want these people to live. Winstone (Snow White & the Huntsman) is always a fabulous choice for a dastardly villain. Darren Aronofsky’s Noah is a labor of love that maintains its artistic integrity amidst special effects, threats of infanticide, and giant rock creatures. Aronofsky has forged a Biblical epic that reaches beyond the pew, providing added surprise and depth and suspense. The man takes the modern fantasy epic template and provides new life to one of mankind’s oldest tales, staying reverent while opening it up for broader meditation. It’s a weird movie, but the silliness is given a wider context and grounded by the emphasis on the human perspective. It’s a dark movie, but the darkness is tempered with powerful feelings and a sense of hope that feels justified by the end. It’s also a philosophical movie, but the questions are integral, the stakes relatable, and the answers hardly ever easy to decipher. This is a rare movie, let alone an example of a Biblical film, that succeeds by being all things to all people. It’s reverent, rousing, thought provoking, exciting, moving, and a glorious visual spectacle of cinema. Aronofsky’s epic is a passionate and thoughtful movie that deserves flocks of witnesses. Posted on April 2, 2014, in 2014 Movies and tagged book, christian, darren aronofsky, drama, emma watson, end of the world, fantasy, jennifer connelly, russell crowe. Bookmark the permalink. 1 Comment. It’s an odd-mixture of all the strange stuff Aronofsky does with his movies. But at the same time, it’s still trying to be a traditional, big-budgeted, safe and pleasing biblical epic. It makes it a bit of a mess, but a fascinating one nonetheless. Good review Nate.